In early October, as more and more Ebola cases started emerging in Kuntorloh, our partners in Sierra Leone saw that there were local people still moving around the community who were living in homes where someone had died from Ebola. Tracer teams, burial teams, the World Food Programme and police, who together were to force households into quarantine if a member of the household has died due to Ebola, were not able to coordinate sufficiently. In partnership with respected community leaders, we began approaching some of these households to encourage and support them to stay within their home for the quarantine period in order to prevent further spread of the Ebola virus. 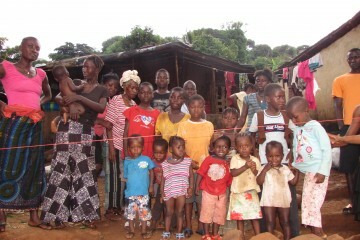 This quickly grew into a effective quarantine programme, reaching all communities in Freetown. When a death in a household is confirmed to be caused by Ebola, we provide everything a family needs to stay in their home for 21 days: food, water, fuel, phone credit, batteries, a basic medical kit and other necessities. The team also offer counselling and health support services, carefully monitor the family’s health so that any suspected Ebola cases are diagnosed and treated quickly at the nearest facility. To date, Lifeline Nehemiah Projects’ Ebola Response team have provided over 2,800 people with the essentials they require to stay in quarantine and reduce the spread of the disease. Learn more about Lifeline Nehemiah Projects here.